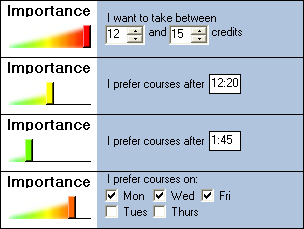 I've built a control that lets the user set all sorts of preferences for his or her schedule. Here, for example, I've demanded that the schedule include 12 to 15 credits, and have indicated a strong preference for Monday/Wednesday/Friday classes. In this case I'd prefer classes after 12:20 but classes after 1:45 would be a little better. I built the SeverityMeter control (the colorful slider) from scratch by creating an image of the slider and then writing code to move a button back and forth based on mouse and keyboard events. Each entry in the list is a particular type of PreferenceViewer, which means I can create any kind of Preference I want and just throw it in the list. Next Up: Create a "library" or "toolbox" of possible preference types so that the user can pick and choose those to include.